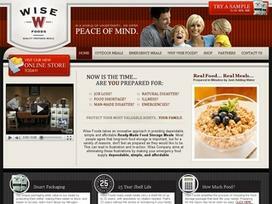 The Wise Company is a specialist in both freeze-dried and dehydrated foods. In emergency situations, for backpacking through the wilderness or for a simple quick meal, Wise Company is the premier choice. Unlike other long-term food companies, Wise Company pays meticulous attention to detail. Its ready-to-eat meals, snacks and entrees are prepared for both maximum storage life and the best possible flavor. Nutrition is also never sacrificed to get great shelf life. Each item of food is prepared with unique seasonings for the best, distinctive flavor. The preserving process for each item is determined by both best storage life and retaining great flavor once the food is reconstituted. Depending on which method is best for the food, Wise Company uses both the dehydration method and freeze drying. Having a long shelf life is important, but Wise Company knows the importance of having foods that taste great tomorrow or years from now. With just the right processing techniques and careful balancing of seasonings, Wise Company foods have an extended shelf life and yet retain delicious, just-prepared flavors to meet every family's needs. Once the food is reconstituted with hot water, its flavor is just a good as when it was prepared for your shelf. Wise Company foods are prepared and packaged in individual nitrogen-packed pouches by flushing out the oxygen using nitrogen enhances the storage life and flavor. The separate pouches enable the consumer to choose only one or several servings without compromising the integrity and storage life of the rest of the food. These can be used for a quick family breakfast, lunch or dinner next week or as a survival meal years from today. The foods are prepared with the greatest care so that their appearance, taste and nutritional value is locked in. Whether on your table tonight or in the center of a disaster-ravaged area, the food keeps its shape, texture and flavor to enhance a family meal today or bring peace and welcomed comfort in any emergency situation. The Wise Food Storage Company is the standard for long-term foods. Most foods can be stored in a dry area, kept at around 55 degrees and easily store for 25 years or more. Trail and outdoor foods have a shelf life of around 7 years. Either way, when properly stored, their advertised shelf life never degrades the quality and flavor. Famous authors, radio and television personalities have endorsed Wise Company. Public figures work hard to develop and maintain a level of trust with the public. They never endorse a product without investigating its claims and quality. Several public personalities are happy to endorse the products from Wise Company. Without hesitation, the company knows the quality, integrity, dependability and flavor of Wise Company foods. Invest your storage food dollars in the finest emergency foods. Trust Wise Company to stock your home's emergency food shelf. Share what you think about Wise Food Storage, and your favorite ways to save there!